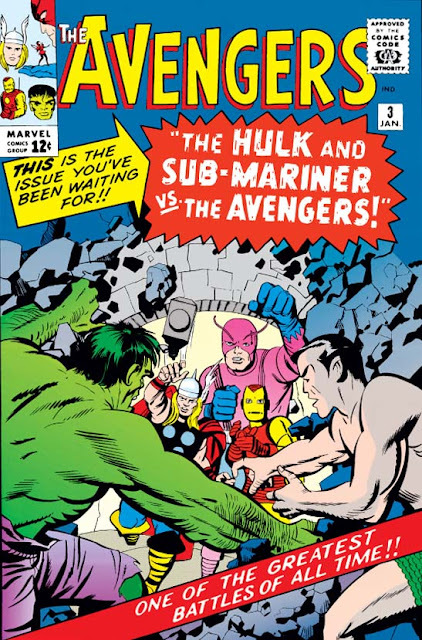 In Avengers #1, the team was pulled together by the perceived threat of the Hulk, though he was accepted as one of their own by the end - so the twist in their second issue, when he turns his back on them and leaves the group, was rather shocking. 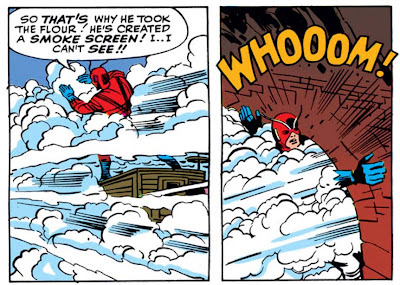 (If this was Stan's method of telling the readers that Anything Could Happen, it was certainly effective!) But he's too wild and dangerous of a threat to simply let roam, of course, so the Avengers open their third issue by declaring their intention to track him down. Though now he's not just a threat - he's a threat with a grudge...! If this were a cartoon, the next shot would be Giant-Man sliding slowly to the ground. Further, we're starting to get a sense that Stan is maybe figuring out what works about the Hulk, and what doesn't. Banner still has the user-activated gamma machine (still a terrible idea) - yet this issue doesn't show him using it to become the Hulk, but only using it to turn back into Banner. Additionally, this might be the first time we see Banner turn into the monster from stress alone, and later in the tale that same level of excitement (or simple plot convenience?) turns him back into Banner. Whatever the details, the significant point is that Stan is finally starting to re-emphasize the Jekyll/Hyde curse so effectively conveyed in his first appearance, and rarely seen since: Banner's a nice guy. The Hulk's an angry brute. And he's changing back and forth against his will, regularly experiencing a loss of humanity - and unable to do anything about it. from his own betrayal at the hands of Doom? 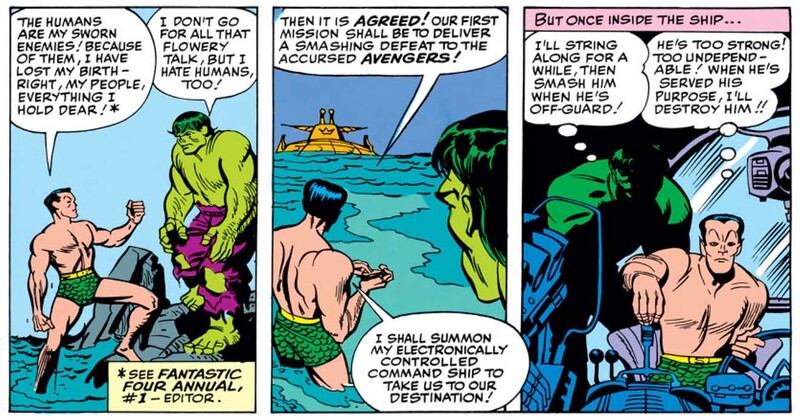 But hey, one morally gray threat isn't enough for this issue - so we get the return of Namor as well! Up to this point in the Sub-Mariner's 1960s revival, the quasi-villain has only been a Fantastic Four character (with a quick stopover in Strange Tales to fight the Human Torch). Having Subby break out of this narrowly-defined role shows Stan's further cross-pollination of the various Marvel titles - but then, that's as should be expected from a team made up of characters who all have their own titles. In fact, this issue also features guest appearances by the Fantastic Four, Spider-Man, and the X-Men (not to mention Rick Jones and the Teen Brigade) - in other words, every single superhero with their own comic, and then some! This is the current size and state of the Marvel Universe, its entirety seen for the first time in a single comic. Note that the referenced occasion came out just the previous month! Clearly Stan was planning meticulously and coordinating all. That said, the comic can't win on all fronts. With three issues under its belt, we can safely declare that this title is all about Plot and Action - so much, in fact, that there's little room for anything else, and certainly no place for any significant character developments or interaction. But then again, that's understandable; any readers of a hero's primary book would surely feel cheated were any real developments to happen outside that main title - but it does mean that a team book would necessarily have to avoid any important developments. (This dilemma would be rendered moot the following year, with the sea change to occur in issue #16.) And even though last issue pointed out the change of identity that Hank Pym had undergone between issues #1 & #2, this time there's not even a word about Iron Man's new look; it's simply expected that the readers are keeping up with the game! In these first three issues, the one constant throughout has been change - and that will continue with #4 as well.